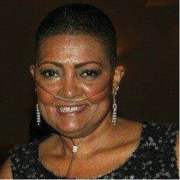 TMurph58 is a longtime PatientsLikeMe member who is living with ALS. You may remember him from his 2012 interview, when he talked about the “Treat Us Now” movement and his experiences with ALS. We recently caught up with Tom, and he shared about his extensive advocacy efforts over the past few years, including his recent presentation on patient-focused drug development with Sally Okun, PatientsLikeMe’s Vice President of Advocacy, Policy and Patient Safety. Catch up on his journey below. Hi Tom! Can you share a little about your early symptoms and diagnosis experience? I think I was very lucky to have a knowledgeable general practitioner – my actual diagnosis only took three months to complete even though I had to see three separate neurologists. My early symptoms started in my right hand with weakness and the atrophy of the thumb muscle – I thought it was carpal tunnel syndrome. The ALSFRS-R measures activities of daily living (ADL) and global function for patients with Amyotrophic Lateral Sclerosis (ALS). The ALSFRS-R provides a physicians-generated estimate of patient’s degree of functional impairment, which can be evaluated serially to objectively assess any response to treatment or progression of disease. What sort of advocacy efforts have you been involved in since your diagnosis? PatientsLikeMe (PLM) Member since January 2011. Active with the ALS Association (raised over $80,000 to date) – my most current activity. On 8/2/2011, FM 106.7 The Fan (Sports Junkies) hosted an ALS Awareness Day Interview. 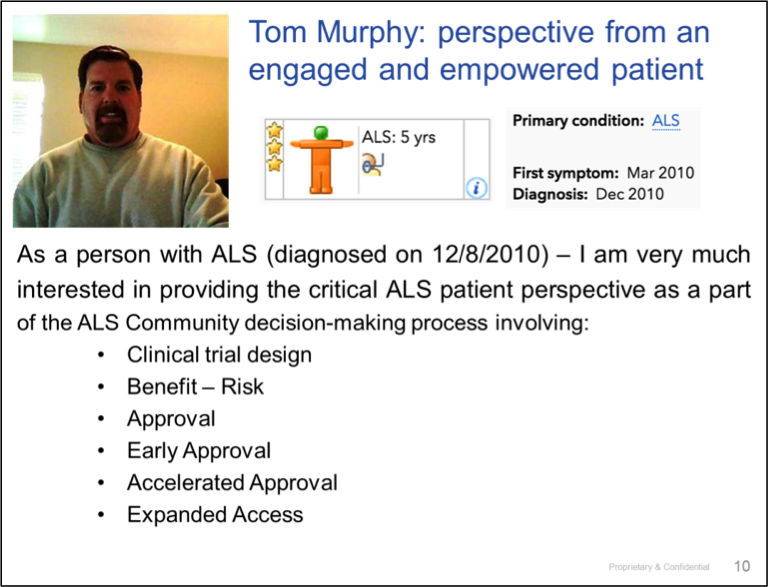 March 2012: Featured Interview on PatientsLikeMe (PLM) –Meet ALS “Treat Us Now” Steering Committee Member Tom Murphy. April 24-25 2012 Visit to Capitol Hill with Former Neuraltus CEO (Andrew Gengos) – Summary: I think Andrew Gengos (CEO Neuraltus) and I made a good “team” – Both Industry and Patients “partnering” with a consistent message related to Expanded Access and Accelerated Approval for Rare and Life Threatening diseases such as ALS. Raised over $30,000 for a collaboration between ALS Treat Us Now and the ALS Therapy Development Institute (ALSTDI) and rode the last 15 miles of the ALSTDI Tri-State Trek in July 2012. 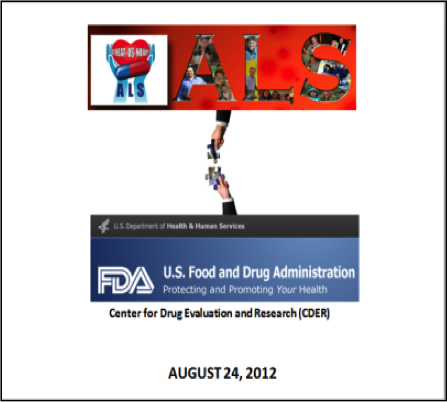 Presentation made to the FDA CDER on 8/24/2012. Participant in the Biogen IDEC Phase 3 Dexpramipexole Clinical Trial (EMPOWER) – from May 2011 – September 2012 and in the Phase 3 Dexpramiexole extension Clinical Trial (ENVISION) from October 2 – November 7, 2012. Completed the Phase 2b Cytokinetics Tirasemtiv Clinical Trial. ALS Public Hearing held on 2/25/2013 — I was the first person with ALS that spoke. My testimony starts at time mark 40:58. July 2013 – Invited to serve as a Patient Representative/Special Government Employee (SGE) consultant to the FDA Peripheral and Central Nervous System Drugs Advisory Committee. 2014 NEALS Clinical Research Learning Institute (CRLI) Ambassador – The ALS CRLI, sponsored by the ALS Association’s TREAT ALS initiative, is an intensive program dedicated to educating attendees on clinical research and therapy development and empowering this group to be advocates for ALS clinical research. September 2014 – interviewed on NPR regarding funding crunch for biomedical research in the United States. 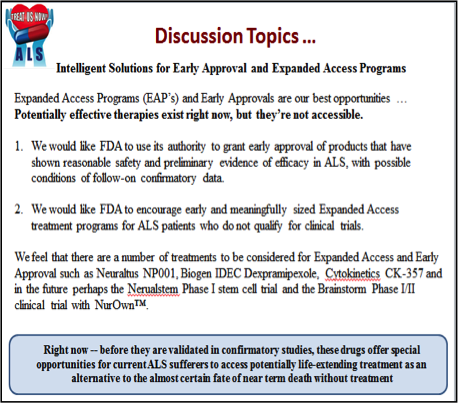 Avid supporter and outspoken advocate for FDA Accelerated Approval of Genervon’s GM604 for Use In ALS. Feature in Neurology Now Article: February/March 2015 – Volume 11 – Issue 1 – p 26–33: After The Ice Bucket Challenge. Presented (co-presenter with PatientsLikeMe VP Sally Okun) at M-CERSI Conference on Patient-Focused Drug Development. Member of 29 ALS related Facebook groups. Instituted a Google Internet search that brings back my email any and all news or happenings related to ALS on a daily basis. You’re a 3-star data donor on PatientsLikeMe – what do you find helpful about tracking your health on the site? Because of this site, I think I have the most complete documentation of my disease progression in treatments than anyone in the health industry. It is a great tool and has been unbelievably helpful to me over the last four years. Finally, congratulations on your 33-year anniversary! As a father and husband, what’s one thing you’d like to share with the community about ALS and family relationships? At the end of the day, given all the challenges those of us with ALS face – nothing is more important than your family relationships and the love you share.